Oh my goodness! The pledges for #MMMay14 really are rolling in thick and fast. Plus all of you are clearly thinking carefully about the specifics of your own pledges to make them do-able but still challenging. The carefully thought-out ones are bound to be the most useful and interesting I reckon. With less than a week to go until 1st May, I'm sure there are still some people who wish to take part in this year's challenge but are yet to sign up. As much as I'd like to highlight all the pledges so far, I'll just pick a few which may inspire those who are still mulling over what to commit to during May. If you think that pledging to wear one self-stitched garment a day would be too much of a stretch, how about a different number of garments per week? Krafty Kat aims to wear five me-mades each week during May. 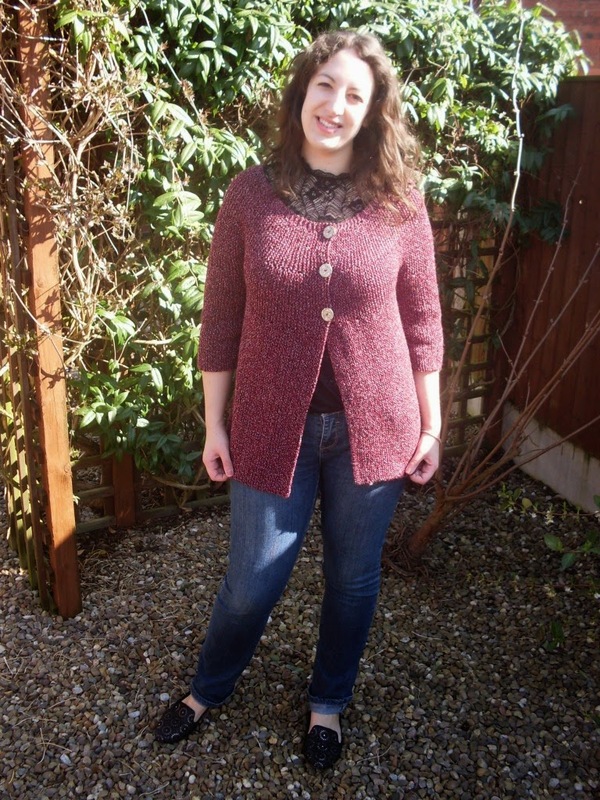 If it's nippy, maybe she'll wear her gorgeous recently finished Corrine cardigan (pictured below). If you've run out of steam mid-project and you're sick of them laying around, then why not make part of your pledge to finish them up during May? 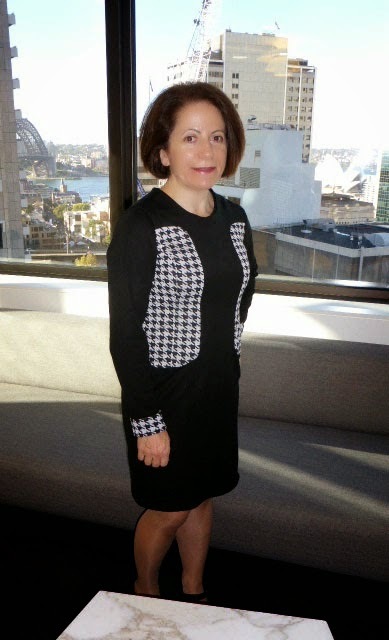 Mikhaela from Polka Dot Overload aims to use this year's challenge to do just that after having found that many of her previous makes no longer fit or have gone missing. Check out her beautifully colourful array of UFO's pictured below. I can't wait to see some of them completed and her wearing them before 1st June. If you've already been thinking a fair bit about what garments you make and why, Me-Made-May'14 could be a great opportunity to test those theories. For example, in addition to pledging to wear at least one handmade garment and one handmade accessory every day, Becky from Sew and So is also using this challenge to test out some of the conclusions she's come to while working through the Wardrobe Architect series hosted by Colette Patterns. Thankfully she's already figured out her A-MAZING new tea dress fits the bill! This challenge doesn't have to be all about you (but of course it can be!). If you regularly make things for your loved ones, you could take inspiration from Maider of Masustak Eguzkitan who has not only upped her ante this year to wearing five garments per week herself, but once a week a friend or member of her family will also wear something made by her. I did something similar for my pledge for Me-Made-May'12. I found the logistics for documentary photography were challenging (which I chose to do but of course you do not have to), but the extra layer of participation was so much fun it was totally worth it. I could go on and on... Each and every pledge that has been submitted so far is an inspiration, because it means that someone is taking an active step to improve their relationship with their wardrobe and their love of making clothes. It hopefully hasn't escaped your attention that Me-Made-May'14 is firmly on the horizon. If you wish to participate in the challenge this year but have yet to sign up, fear not, you have until 30th April to throw your metaphorical hat into the ring. I've been thinking for a while about the specifics of my own challenge pledge this year. Even though I've been wearing almost exclusively me-mades for a few years now, I haven't had to think too hard about how to amp up my challenge, life has done that for me. I was pregnant during MMM'13, which meant that my altering shape kept me on my toes. The range of garments that fit me at the beginning of the month slowly dwindled towards the end of the month, and I had to make new items to keep me in sufficient clothing options as I got larger. Dress Dolores in something made by me as many days as possible (laundry permitting). I'm not pledging to do this daily as she has been given so many hand-me-downs recently that she currently has sufficient clothing. Plus, it would be a waste of sewing time and fabric to make a whole load of things for the sake of the challenge, when anything I make her would only fit her for a couple of months. Wear every item of knitwear that I own at least once throughout the month. All my knitwear items are secondhand but wardrobe space is at a premium so if any aren't getting used I need to figure out if they need to be reworked, made in to baby wear or donated back to a charity shop. 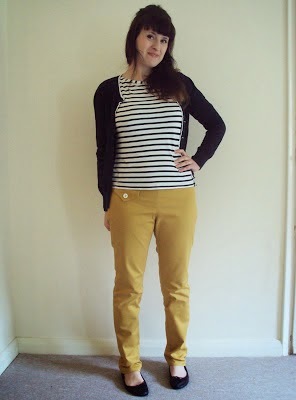 Highlight any me-mades that need to be reworked (like my mustard trousers, pictured above, that have stretched out at the waist) or mended (like my school boy trousers, pictured below, that have a few holes appearing at the seams). Take inspiration from the Big Spring Contest WINNER Miriam (!!!!!) and generally be mindful about using what I own. I read somewhere once that women tend to wear 20% of their clothes 80% of the time, and 80% of their clothes 20% of the time and I'd say that's about right! I'm not about to chuck out everything that hasn't been worn since the last MMM'13, but I would like to push my ratio of regularly worn clothes towards 50% of what I own. Have you heard of Perfect Pattern Parcels? Well I must admit that I hadn't until a couple of months ago, and it is a very cool thing indeed. 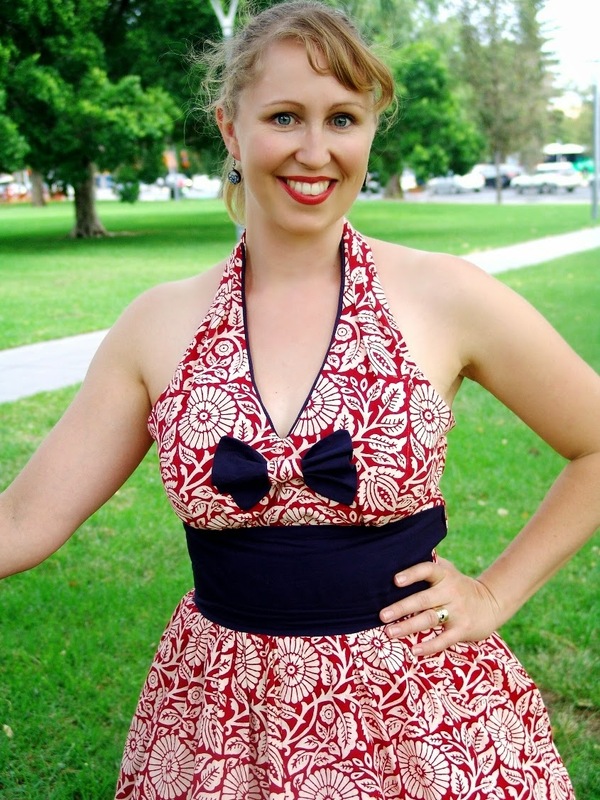 The organisers put together a package of PDF sewing patterns along a theme which have been created by indie designers. 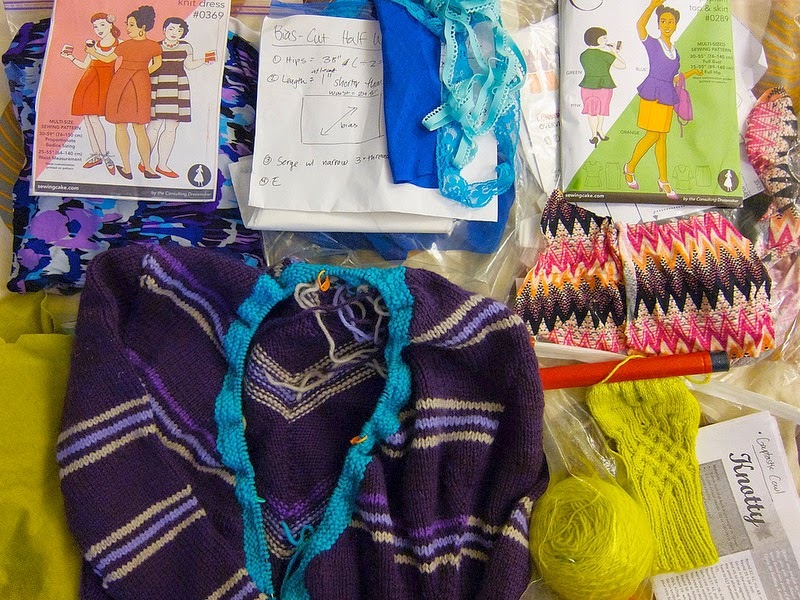 You can then purchase the pattern parcel for a price of your choice for a limited time only, and then ALL the profits go to supporting a charity called Donors Choose which funds and supports educational projects in the US. 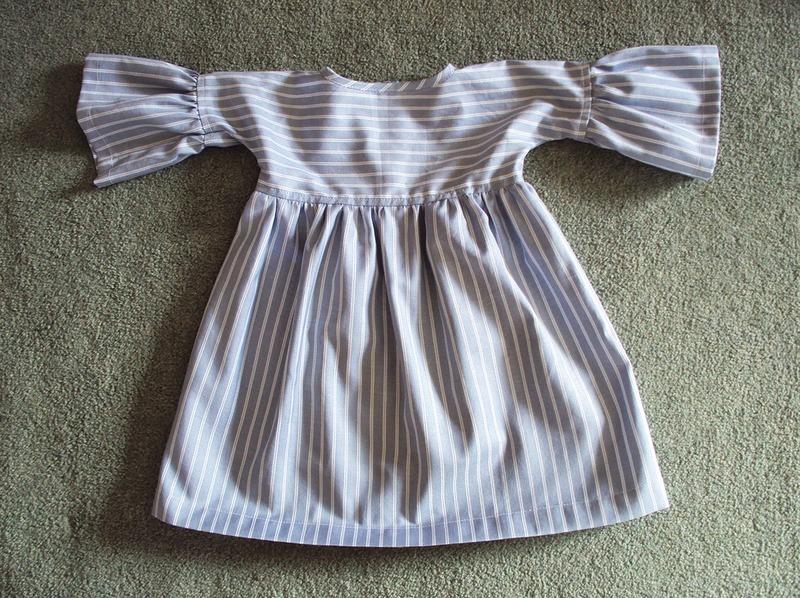 The current pattern parcel (#2) comprises of patterns for little girl's clothing (pictured above) and there's some real beauts in there. I chose to make the September dress/tunic pattern (the turquoise garment on the left), designed by Too Sweets Patterns. I wanted to make a simple, unfussy interpretation that clearly showed the bones of the design. However, I think this pattern would also make a very good canvas for all sorts of interpretations (applied pockets, bib or ruffle details, contrast yokes, omit the sleeve sections, braid or ribbon applied in various ways etc. etc.). It's also a pretty simple make, therefore a nice project for a beginner, or a pleasingly quick make if you are a fairly experienced seamster. Either way, it's a perfect project if you are making this as a fun gift or for your own little handful. This pattern ranges in sizes from 12 months to 10/12 years. I made the size for 2 years and will be keeping it safe for the next year and a half for a certain little missy. 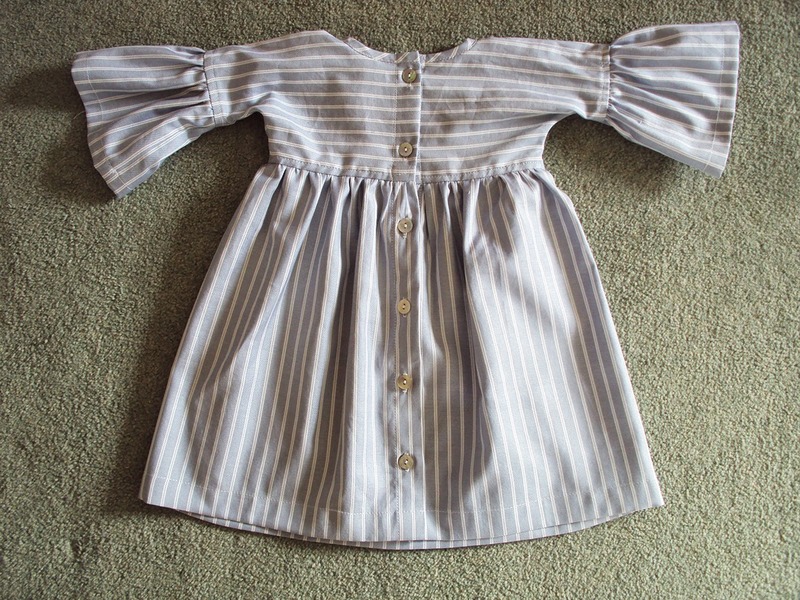 I made it in some lovely, good quality striped shirting that's been lurking in my stash for a couple of years. I used the stripes in different directions as the only real design addition of my own. 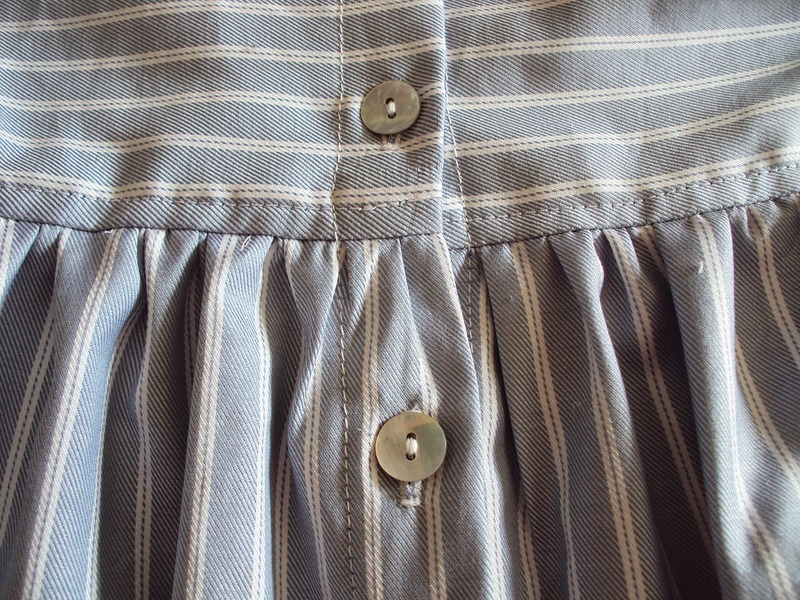 This was also a great project to give me the kick up the bum I needed to figure out how to make buttonholes on my new (to me) sewing machine. I used 6 greyish mother of pearl buttons as the fastening up the back. I'd definitely recommend making this pattern, such a fast and fun project. Plus I'll be making some of the other patterns for sure. 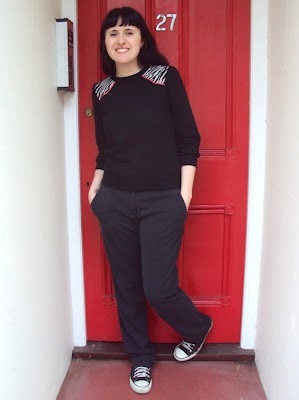 If you wish to see what the other styles look like made up, check out Shawnta Sew's version of the Hosh trousers and Hanami blouse, plus she helpfully links to a whole load of the other sewing bloggers who have been making their own versions of the various patterns. I'm totally behind this project for a number of reasons. I love that it supports and promotes independent sewing pattern designers: that is allows them an interesting, imaginative and unusual platform for us sewers to discover and use their products. The charitable element is also fantastic and I wish the whole endeavour lots of success going forwards. Remember that there is a very limited window of opportunity to purchase these super cute patterns, so if you are interested, don't delay! "When I read Zoe’s theme – everyday awesome – I loved it. What better thought to carry around in your heart than: there are ways as creative people to make everyday awesome. We are given this day, others were not. Some people’s days are taken from them by death, by force, by poverty, by slavery, by chance. We are given this day. This is a day to celebrate. As a mama I have well known the pyjama filled days, those days of distaste at the stretch marks that have turned my tummy into something that resembles a deflating balloon. But I also know that getting up and dressing up for the day, choosing that favourite dress, those shoes that make you feel indestructible, those earrings given to you by someone who thinks you are wonderful – those days are better days. Sometimes by being everyday awesome and wearing something special instead of saving it for a ‘proper’ occasion, we make someone smile. For the last 3 years I have journeyed through 10,000s of earthquakes in Christchurch, as the earth has destroyed grandma’s china, houses, sewer lines and lives it has also built communities that are knit together, it has made empty spaces that creative people have filled and it has taught us that what matters and what remains unshakeable are relationships. It has taught me that joy and love and shared laughter are my gifts to the world and I will give them with all the generosity and in every creative way I can think of. It has taught me that I can, and should, use and enjoy my special things everyday or I can save them, only to find they are destroyed anyway. The value is not in the things themselves, it is in the use and pleasure we derive from them. It has taught me to use, wear, enjoy, and share today. I’m not waiting for a special occasion. Today is awesome. Every day is awesome. I am not the youngest, oldest, wisest, strongest, prettiest, cleverest, slimmest woman in the world and so I owe it to myself, to other women, to my children and to others to declare (often with how I dress,) to say I’m not waiting for a special occasion, a better body, a better day. I am taking hold of today and I am declaring it to be awesome." Amen to that! So PLEASE go to the Offset Warehouse's Facebook page and vote for Miriam (D) so she can win the lovely prizes I feel she so deserves. You know that she will treasure and use the prizes, and anything she doesn't I have no doubt she will not allow to sit around her home gathering dust, she'll pass them on so others can derive pleasure from them. Go on, please vote for Miriam!!!! !